n 1983 the European Parker pen lines were reorganised. 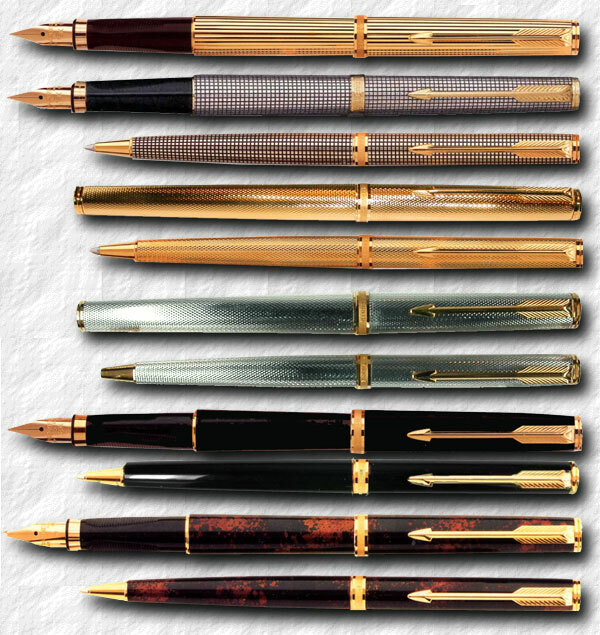 The Parker "61", Parker "65", Parker "85" and Parker "105" were discontinued. The 61/65 was at the end of a long stretch and the 85/105 hadn't been all that successful. Instead Parker decided on a new member to the Parker "75" family and The Premier was introduced in September 1983. It was produced by the Parker factory in Meru, France, and borrowed many features from the Parker "75". The nib and section was very similiar to the Parker "75" but to enhance the fact that this was a top line pen, the Premier got an 18 carat gold nib. The pen was also longer and wider than the Parker "75" and sported a new, facetted cap band and had two black onyx jewels at the ends. he first finishes offered was the Presidential, a pen in either 18 or 9 carat solid gold in a striped Godron, a wide spaced, deep cut vertical engraved pattern. Another very attractive model was the Athenes, which was a 22 carat gold plated pen with laque inserts, creating a very striking striped pattern. There was also silver or gold plated models in Grain d'Orge, also known as Fine Barley. The fourth finish was a speckled brown chinese laque and the fifth finish was the Sterling Silver Cicelé. This pattern was elegedly borrowed by Kenneth Parker from an English cigarette lighter in the 1960's. The very pattern that made the Parker "75" a workhorse through twenty years of hard times selling fountain pens. Well the Premier, especially the Cicelé, did sell well and a black turned cast acrylic model called Noir was added to the line, while the 9 carat Presidential was discontinued. oller ball and ball pens were also offered, featuring the faceted cap band, cap tassie and barrel nozzle. It was twist actuated. Also pencil version was offered with an intricate twist button mechanism. There was also a rare desk stand offered. It was describes as a hand applied Japanese Urushi laquer in red and black with an Athenes roller ball pen sporting a 50 millimeter black end cap. It was offered either as a single or double set at $350 and $500, respectively. In 1989 the Athenes and the silver plated Grain d'Orge was discontinued. The Premier was last featured in the 1992 catalogue, although some sources claim that it was sold until 1994. Towards the end the Premier was also being manufactured in Newhaven in the UK. There are a wide range of test-finishes, or prototypes if You will, that has seen their way into collector's hands. The Parker Premier: Athenes, Cicelé, Grain d'Orge, Grain d'Orge silver plated, Noir and a set of Chinese Laque, 1988.
lthough the pen had a ten year-plus run, items are expensive and not readily available to collectors today. The solid gold models are of course rare and increasingly expensive. The non-solid gold models are surprisingly light but, like the Parker "75" have excellent balance and ink flow, even using the perhaps unjustly despised Penman ink. The demise of the Premier had more to do with company policies and a strategy to rejuvenate the Parker product catalog, than with the quality of the writing equiptment itself. ike in the early 1920's Parker decided to slim down the model range and concentrate on a few, also slimming down the cost of manufacturing. Like in the car industry, it's cheaper to make one part fits all, than a multitude of parts in small numbers. Enter the Sonnet. One design in a wide range of finishes and pricing. Thus the Premier, the fabulous Parker "75" and the Parker "95" was hand in hand lead into a production obliviance. The Premier desk set in Japanese Urushi.